Whether you're trying to lose weight or training for a big event, monitoring your progress can help you stay on track. Writing down the exercises you've done, the amount of time you've spent on cardio and other factors of your daily workouts will give you a better idea of what's working well and where you might need to improve. Using a spreadsheet program, create a simple chart that you can print out and fill in with a pen or pencil as you go along. Open your spreadsheet software and start a new file by selecting "File" and then "New" or "New From Template." If your program has available templates, choose a "workbook" style template, or one that will automatically create vertical and horizontal cells on the page. Type "Date" in the "A1" cell at the top left of the worksheet. Move over to the "C1" cell -- two cells to the right of the top left of the page -- and type "Cardio Type." In the next cell to the right, type "Cardio Length." In the next cell to the right, type "How I Felt." Cardio is an essential part of exercise, and you should be doing at least 150 minutes of it each week, according to the guidelines set forth by the U.S. Department of Health and Human Services. That breaks down to about 30 minutes a day, five days a week. Make a list -- on a piece of paper or in a text document on your computer -- of all of the strength training exercises you do on a regular basis, such as bicep curls, leg extensions, pull-ups, or sit-ups. Strength training is another essential component of a regular exercise routine, and HHS recommends all adults do total-body strength training exercises two days a week. Skip one cell and move to the cell one to the right of the "How I Felt" cell. Type one of the strength training exercises from your list, such as "Bicep Curl." To the right of that cell, type another strength training exercise you do. Continue adding cells for each exercise you do until you've exhausted the list. When you're done, save the file. Drag your cursor from the top left of your spreadsheet to the right, highlighting all of the columns you've created for your types of exercise, as well as a few empty column cells to accommodate other types of strength training exercises you may do. Drag the cursor toward the bottom of the screen also, so that about 20 rows -- the vertical cells on your document -- are highlighted. Then select "File" and "Print Area" or a similar function that will print the area you've selected. Write in the date of your workout in the "Date" column of your workout log, and then fill in the other cells as you complete them. For the strength training cells, write down the amount of weight you lifted as well as the number of repetitions you completed; for example, for the bicep curl, the cell may look like "20/15." When you've used up all 20 vertical cells -- meaning you've worked out 20 times -- print another copy of the workout log and start again. You can also fill in the document right on your computer so that you maintain an electronic log of your workouts, but that means you'll have to have your computer or electronic device handy while you do the workouts. Your workout log can contain any information that you want to track. You might also want to add cells for weight, waist and other physical measurements. 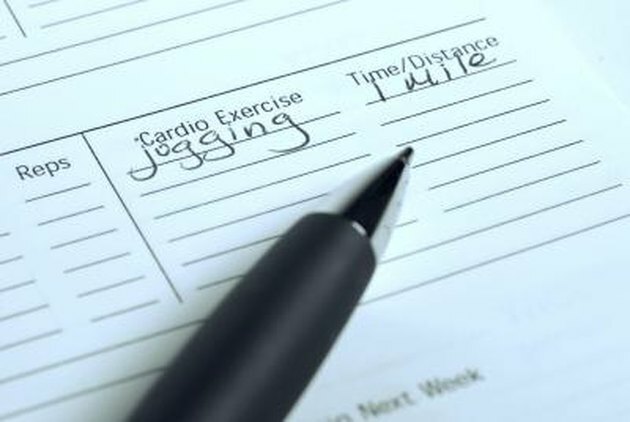 If you're not so tech savvy, create this workout log by drawing columns and rows on a piece of paper, and then fill in the date and exercise columns as you so desire.